Copper miner Freeport McMoran surprised the market by acquiring two American oil & gas companies for approx. $9bn, taking on a lot of target debt to make a total deal size of approx. $20bn, the second largest acquisition in the industry this year. Freeport did not request shareholder approval for the diversifying acquisitions, leaving a large part of the shareholder base unhappy with the deal and the stock price dropping approx. 15%. Xstrata’s $5.9bn Tampakan copper project in the Philippines is put on hold while waiting for government approvals: the federal government doesn’t want to give the go ahead before the mining law is reformed, and the local government is opposing the issuance of an environmental permit based on a ban on open pit mining. The board of Bumi plc has indicated that it favors the Bakrie offer to buy out the assets of the Indonesian coal producer over Rothschilds offer to increase the stake in those assets. Bakrie’s offer implies that the shared ownership of assets by Bumi and Bakrie comes to an end. The board also indicated that it does not intend to sell the stakes in Berau to Bakrie, which would mean the company does not completely revert to a cash shell. 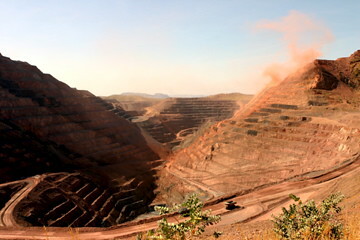 Xstrata’s decision to put the Tampakan project, one of the largest development projects in the copper industry, on hold fits two trends: the increasing importance of alignment with both federal and local governments in developing countries, especially around when governments and legislature are changing; and the hesitance to undertake any large investments in a time of rising costs and uncertainty around demand growth. Check my latest column in the free online journal The International Resource Journal on the importance of iron ore derivatives. “China’s biggest gold producer, Zijin Mining Group Co., has made a 545 million Australian dollar (US$499.2 million) takeover bid for Australia’s Indophil Resources NL, seeking to gain access to the US$5.2 billion Tampakan copper-gold mine in the Philippines. Tampakan is ‘a world-class copper-gold deposit [with] an annual production rate of 340,000 [metric] tons of copper in concentrates and 350,000 ounces of gold [about 10.89 tons],’ Zijin said in an official filing to the stock exchange, terming the Philippine asset as the key draw of the deal. The Tampakan resource is developed by a Xstrata subsidiary which holds the remaining 62.5% of the shares. Earlier this month Xstrata announced it would continue the mine studies on Tampakan, despite the potential ban on open pit mining imposed by local government. Chinese companies are not attempting to secure access to basic building materials, but as well to precious metals and diamonds. The market for these goods will shift increasingly to China and India. It is therefore likely that another Chinese company will contact Indophil. As long as the Phillipine government does not decide on the future of the project it is unlikely Indophil will get a good price for its 37.5% stake in the project. “A unit of Xstrata said on Friday it will proceed with public discussions and technical studies on its $5.2 billion copper-gold project in southern Philippines despite a looming local ban on the venture. State agency Mines and Geosciences Bureau (MGB) said it may question the ban with the courts as a last resort, adding the measure could hinder investment in the mining sector. Manila has ambitious plans to develop the mining sector from a moribund state by attracting billions of dollars of foreign investment. Local government at Tampakan has banned open pit mining at the Tampakan deposit. Fears are that the large scale mining operation will pollute the local river on which water many farmers are dependent. Local government might be overruled by national government. However, Xstrata will need to prove to the locals that the open pit mining operation will not lead to pollution of the river in order to change public opinion. Proving impact of mining on groundwater and river and influencing this impact is typically very difficult, as groundwater aquifers are very hard to map. Underground mining, which is favoured by the local government, reduces the need for lowering the groundwater level, but pollution risk from processing and waste/tailings is the same as with open pit mining.